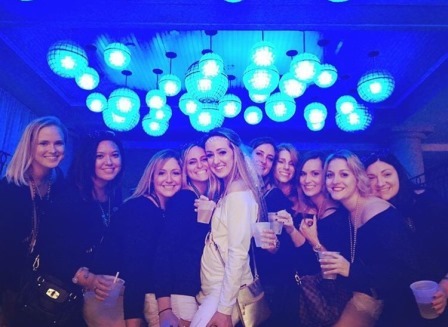 New Orleans is one of the best places a girl can celebrate the end of their bachelorettehood. The city is like no other. Not only is it full of great food and alcohol (which are essential for any good girls weekend), it has a celebratory atmosphere all hours of the day and night, and is a place where you can rest easy knowing that what happens in New Orleans gets talked about on your friend’s travel blog stays in New Orleans. Also, the lack of open container laws is conducive to having cute matching tumblers and walk-around day drinks. New Orleans has several neighborhoods to explore, so you definitely don’t have to spend all of your time being sloppy on Bourbon Street. And the city is filled with history, so you can leave feeling like you actually learned something. I’ve been lucky enough to have experienced New Orleans several times, so if you want to learn about more great restaurants and activities, since this one is a bit French Quarter-focusted, check out my other posts from past trips to New Orleans for Veterans Day Weekend and JazzFest. Obviously, Bourbon Street will be an essential of a bachelorette party weekend, especially if you have anyone on the trip who has never been. (In my case, that was nearly everyone but me). While you’re there, make sure that you keeps your wits about you and if you can’t, make sure you have a buddy who can. There’s definitely some crime and opportunists who like to take advantage of inebriated tourists. But despite the large crowds, tourists, and occasional shady characters, Bourbon Street and the French Quarter are worth spending some time in as they are filled with history. Here’s what to do all hours of the day. Make your home base in the French Quarter. With no shortage of hotels and close proximity to Bourbon Street, the French Quarter is a simple choice for where to stay. 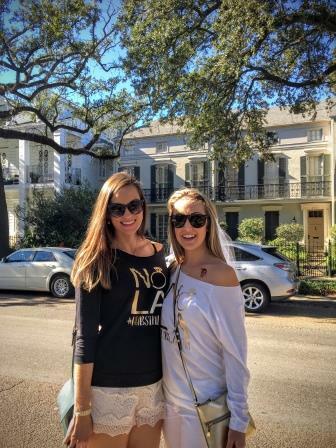 While I would not necessarily stay in the French Quarter on a normal weekend, it was the perfect home base and meeting spot for our large group of ladies and allowed us to stumble home together safely. We stayed at the Crowne Plaza French Quarter which was surprisingly quiet considering its location on Bourbon and Canal St.
Have brunch at Stanley. Stanley is located right on Jackson Square so is a great place to begin your day and fill your stomach before a day of drinking. Stanley’s menu features all of the quintessential New Orleans dishes like gumbo, red beans and rice, eggs benedict po’ boys, and bananas foster french toast. If you’re in a hurry, there is also a walk up bar where you can order off a small menu with breakfast sandwiches and cocktails. ProTip: Order your mimosa or bloody mary mega sized. Get beignets at Cafe Du Monde. Obviously. Whether Cafe Du Monde‘s famous beignets and chicory coffee are your breakfast or an afternoon snack, this is one stop you cannot skip. The fluffy beignets with pounds of powdered sugar are heavenly. Don’t be discouraged by the lines – they move quickly and efficiently. ProTip: Grab a bag of beignets and coffee from the to-go line and enjoy them in the courtyard nearby that overlooks Jackson Square. 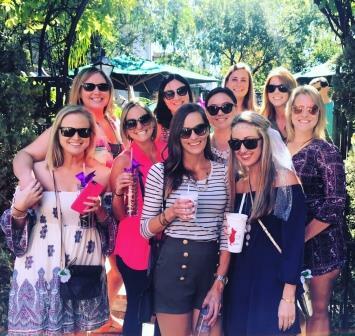 Have daytime drinks in the courtyard of Pat O’Briens. If you’re not sure where to begin, head to Pat O’Brien’s. 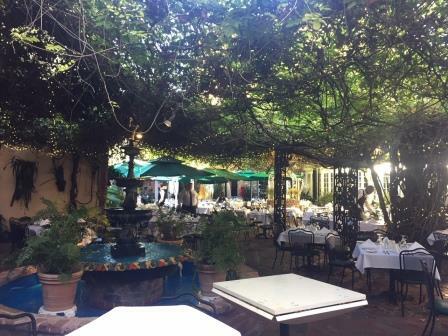 The large courtyard is the perfect place for large group parties to mix and mingle and get the day drinking started. Pat O’Brien’s motto is appropriately “Have Fun!” and they pretty much guarantee it. The Hurricane is their signature drink, but if you fancy something less sweet, there are several full bars where you can order something else. Drink a Shark Attack at Tropical Isle. Even if sweet drinks aren’t your thing, it’s worth it to watch the ceremony surrounding the making of a Shark Attack at Tropical Isle. Better yet, buy one for the bachelorette! Hand Grenades are also available at Tropical Isle. Spoiler alert: Watch the making of a Shark Attack in this video. 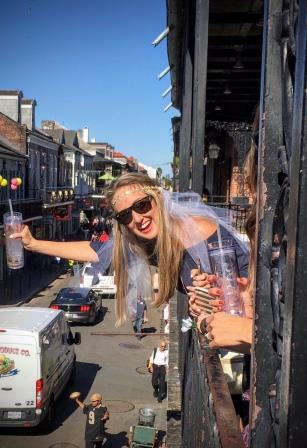 Find a balcony to throw beads. 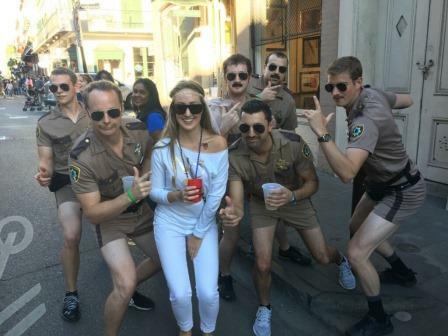 Ladies – turn the tables and throw some beads at guys walking down Bourbon Street. It’s loads of fun, trust me. And personally, I prefer to witness the Bourbon Street mayhem from above, not around me. 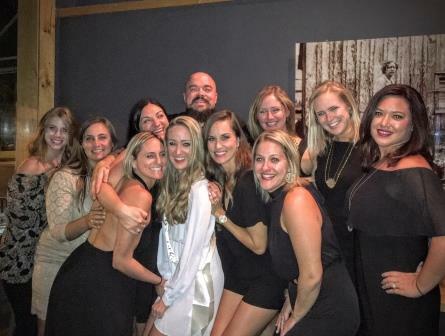 Just look at how much fun our bachelorette had! Take a cocktail tour (or make your own). 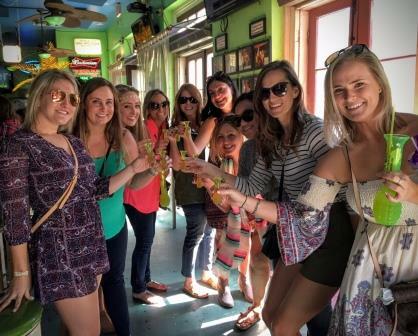 Several groups offer cocktail tours of New Orleans, but this is also something that would be very easy to do on your own if you didn’t care about having a guide. Most of the information a tour guide will tell you can also be found online at sites like this one. Itinerary: Several bar stops where you’ll try famous drinks such as Sazerac, Pimm’s Cup, Ramos Gin Fizz, and absinthe (drinks are typically not included in the tour cost). Our tour stopped at Sazerac Bar, Antoine’s, Court of Two Sisters, Pirate’s Alley, and Tujaque’s. Other tours add Carousel Bar, Lafitte’s Blacksmith Shop, and/or Napoleon House to the tour. Join a parade. It seems like there is always a parade going on in New Orleans. In fact, there was a Halloween parade right outside of our hotel one evening. If you see one, grab your beverage and follow along or stake out a spot to people watch. Eat at Felix’s Oyster Bar or Acme Oyster House. 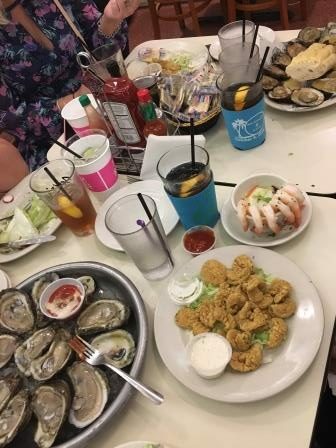 Don’t leave New Orleans without having at least a dozen oysters. Whether you prefer them raw, grilled, steamed, baked, or fried, you can’t go wrong. 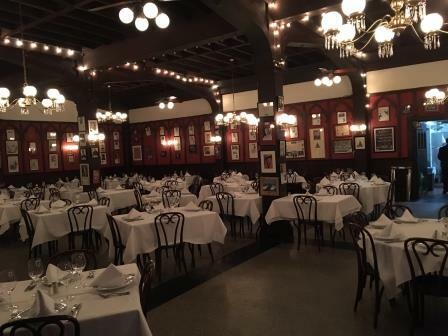 Both Felix’s and Acme are located across from one another in the French Quarter (a block away from the Crowne Plaza). Felix’s is typically the less touristy of the two, although anything in the French Quarter is going to be somewhat touristy and that is just fine! Dance your faces off at one of the bars with live music. My advice is to walk around the French Quarter until you find something to your liking and then put on your dancing shoes. We found a great 70’s/80’s cover band and sang and danced until the wee hours of the morning. Sing karaoke at Cat’s Meow. Even if you’re not a singer (hello –> me!! 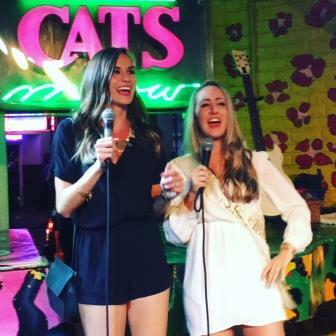 ), Cat’s Meow is the place to sing karaoke. Everyone does it and no one judges. Although there are definitely some intimidating regulars, there are plenty of terrible singers to balance it out. I honestly felt like a rock star dancing with my best friend (the bachelorette) to Miley Cyrus. It was totally exhilarating. Just do it. And in case you were wondering, I was told that my singing abilities were a 4, but my stage presence was a 10. So there’s that! Have dinner at St. Lawrence. St. Lawrence is the perfect place for a low-key casual dinner. With elevated bar fare and craft beer, it’s a great contrast to some of the heavier cajun dishes. They also offer a prix fixe menu ($16 for lunch and $29 for dinner) that includes three courses. Have dinner at Toups Meatery. Remember Isaac Toups, the lovable Cajun, from Season 13 of Top Chef? Toups Meatery, his restaurant in mid-city New Orleans, it is to.die.for. Obviously by the name, this isn’t the place to go if you are a vegetarian (although there are a handful of vegetarian friendly plates). But if you do eat meat, you will be blown away by the tender meats and rich flavors of these inventive yet homey dishes. The chef is just as endearing as he was on the show and is unabashedly in love with his home state. He is inspired by local ingredients and the animals he can hunt and fish for seasonally. We were lucky enough to meet him and he gave us some great recommendations for our time in the city. What to order: Try the duck, waygu beef, and venison. Also, try the veal sweetbread poutine. If you don’t know what sweetbread is, don’t ask! Listen to live music at Blue Nile. For a break from Bourbon Street, head over to Frenchmen Street for some live blues or soul music. Blue Nile is always a reliable bar for great music and a fun atmosphere. Trombone Shorty and a few other famous artists frequently perform there. Have a boozy brunch at Basin. You can spend hours at Basin Seafood and Spirits enjoying their bottomless mimosa brunch, and not surprisingly, we did. From the light and citrusy octopus ceviche to the decadent crab and crawfish beignets to the perfectly cooked poached eggs, every item we ordered was divine. Basin offers a large seafood menu that successfully transforms traditionally heavy Louisiana dishes into lighter versions of themselves. Walk around the Garden District. The Garden District is one of my favorite neighborhoods in New Orleans. 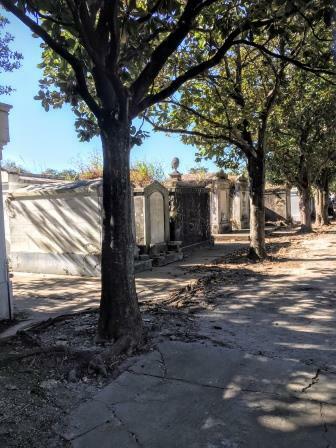 Filled with picturesque mansions, Victorian architecture, historic cemeteries, opulent gardens, and plenty of southern charm, this is a great area to walk around and enjoy the beauty of the historic district. You may even spot a celebrity as quite a few live in the area. Take a streetcar. When you are finished exploring, pay the very reasonable fare of $1.25 and ride the historic green St. Charles Streetcar through the city back to the French Quarter. 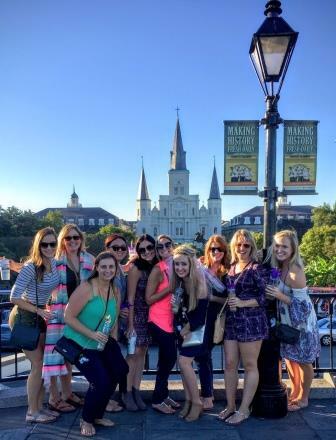 You can’t go wrong with a trip to New Orleans, especially for a bachelorette party, so I hope this post gives you some ideas for your next visit. And don’t forget, I’ve had some epic experiences in New Orleans previously (wedding crashing, Bachannal, etc.) so check out my past posts. As always, thanks for reading and see you next time! 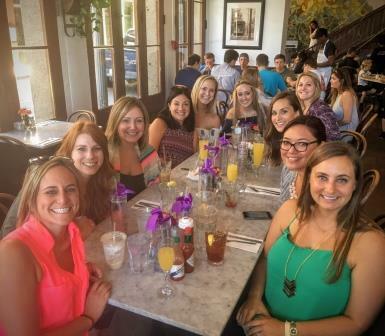 Thanks to these gals for such a fun weekend in New Orleans! Next Las Vegas – Hikes, Food, and Family!